JanetheWriter Writes... : Executive "Sweet"
After lunch today, my sweet tooth started calling my name. I don’t generally hear from it, so when I do, I usually listen. I wandered over to a colleague’s office and was disappointed to find that the bowl located there that's often filled with M&Ms was empty. 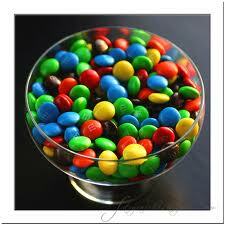 Me (Writer to the President): JanetheWriter is very disappointed that the M&Ms bowl is empty. Writer to the President: Yeah, but Elliott usually has peanut M&Ms. I ate a clementine instead...a better choice all around. Data Management Director: OOOh PEANUT M&Ms!!!!! How was the darling-clementine?? Writer to the President: Not nearly as darling as peanut M&Ms!!! At this point, I was interrupted by the Executive Assistant to the President, who asked if I wanted to know where the “stash” was. When I answered in the affirmative, she showed me, and then used it to refill the bowl, sending the jangling sound of M&Ms through the executive suite. Executive Assistant to the Chairman of the Board: Thank you, @Executive Assistant to the President for refilling!!!!!! Executive Assistant to the President: All is right with the world. The bowl has been replenished. Web Editor: If it’s empty, don’t look at me. I am swearing off them! OK, everybody, now that we’ve had our afternoon break--with or without peanut M&Ms--let’s get back to work!